Trying to alleviate the pain, itching--and sometimes, embarrassment--of skin conditions like eczema, acne or psoriasis can be frustrating and troublesome, whether the problem is chronic or acute. Conventional topical creams, ointments and cleansers can dry or irritate the condition. Worse, in the quest for clear, healthy skin, sufferers may turn to pharmaceuticals, which can pose serious health risks. 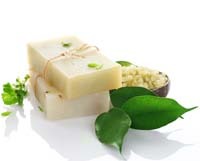 Tea Tree organic essential oils can provide a safe, effective alternative! troublesome skin conditions and infection through the healing and soothing properties of natural tea tree essential oils. These native Australians crushed the leaves of the Melaleuca alternifolia tree and applied the oil to skin abrasions, injuries and cuts. 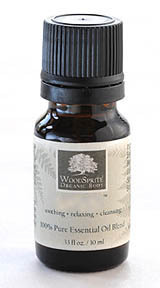 They also used the tea tree essential oils to treat skin infections and burns. for skin conditions and infections. 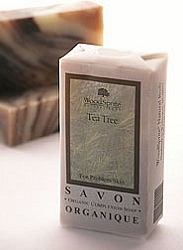 Realization of the growing problem of bacteria-resistant antibiotics in the past century has sparked resurgence in its popularity, along with growing interest more recently in organic living, leading to the incorporation of tea tree essential oils into a number of organic bath and body products, including organic soap, like tea tree oil soap, and other organic skin care products. According to the Australian Tea Tree Industry Association, evidence is mounting on tea tree oil's effectiveness as an antibacterial, antiviral and anti-inflammatory agent. There is also indication that certain tea tree oil formulations can slow the growth of cancerous tumors and use of tea tree essential oils has been linked to improved immunity. Tea tree organic essential oils not only offer health benefits in their own right, but users report their use can often replace pharmaceuticals commonly prescribed for skin conditions, eliminating the risk of serious side effects. Antibiotics prescribed for acne and skin infections kill bacteria on the skin that cause breakouts, but in doing so, they also kill your body's healthy bacteria. Meanwhile, long-term use of antibiotics is contributing to the growing threat of antibiotic-resistant bacteria. Vitamin A-based pharmaceuticals, commonly prescribed to combat acne and other skin conditions, fare no better.These medications work by effectively sealing off your skin's pores, preventing breakouts for a period of time. But eventually the bacteria and impurities trapped inside simply travel to other parts of your body, possibly causing damage elsewhere. There is a reason your physician will usually monitor your liver frequently when you are prescribed these drugs. Organic tea tree essential oils offers a safe and effective alternative to potentially harmful conventional treatments for acne, psoriasis, eczema and other skin conditions. In rare cases some people have reported allergic reactions (such as rashes) can occur so it is important to test a small area of skin before applying liberally. 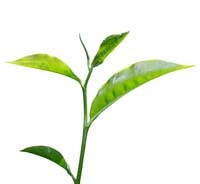 Tea tree oil can be applied directly to the skin or used with a carrier oil, balm, cream or water.